Much of this week’s reading is about the making of the mishkan, the portable ark, and the accoutrements for its assembly and use. I’ve spent the past several weeks working on a different sort of mishkan, the workbook for a class/process I’m developing. 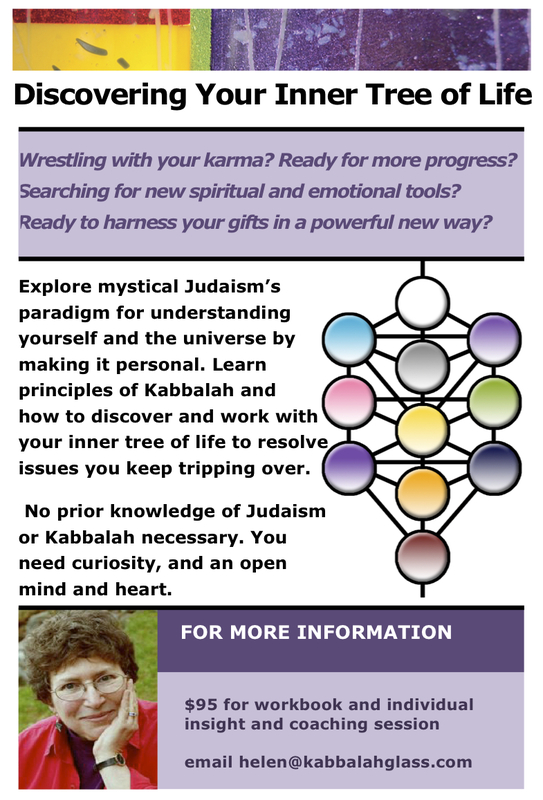 I’m loving the chance to re-encounter Jewish mysticism and to express my take on Kabbalah, the system of insight that’s become the spine of my spiritual journey. Our spirituality is deeply individual. We may share holidays or prayers, language or metaphors, a belief in what’s eternal. But at its heart, spirituality is a conversation you have most often with yourself, and with the world of the unseen, however and wherever you encounter it. The mishkan is a receptor site. A place to encounter the world of the unseen in space-time. Some folks get that sense of connection in services or ritual. I find it most often through writing. In the magical connection between words and synapses. Images and ideas than run through me, teach me, help me talk to others. I hope you find this place, because there’s few feelings as good as being connected with a wisdom greater than one’s own. Developing this course is pushing me to go face-to-face with my beliefs and practices. Just as the ice storm that disconnected me from the internet for days left me grateful for my wood stove, I’m distilling what really matters. What’s necessary and core. What gives nourishment. When it’s incredible joy, it’s rewarding from soul to gut. I hope the same for you, however you get there. I’m working through images and practices that connect us with our highest selves, and that help us examine why our less noble parts sometimes grab the wheel. I’m trying to express these concepts in ways that feel accessible and whole. As I do, I’m struck again by the importance of sharing our best with one another. For me, that’s writing and problem solving. For someone else it might be singing or carpentry. We’re a community. Each one of us part of a whole trying to express itself through the imperfect instruments that we are. Our job is to listen well, and then do our best to give our best. Together we make a mishkan, a place to receive the holy and to heal this imperfect world. We may have snarky days, or clumsy ones. No one can be sacred and in a good mood all the time. No email, phone, and FaceBook made me cranky as well as giving me time to write. Being human means we need lots of slowing and quieting down to hear what we’re supposed to. Turning down outer noise, albeit not by choice, brought all the blessings of any great vacation or extended Shabbat. A chance for reflection, for hearing the universe tell me more than I often try to ask or tell it. Visiting the mishkan of greater quietude. By being in your own mishkan you’ll hear what you most need. Let what comes through open and teach you. However you find your mishkan, I hope you’ll visit often and receive much. PS – If Discovering Your Inner Tree of Life sounds interesting, please let me know. This entry was posted in Exodus, TorahCycles: Midrash for self-exploration and growth and tagged class, journey, judaism, mishkan, personal growth, spirituality, Tree of Life, values by Helen. Bookmark the permalink.